Our bin broke a little while ago. Not seriously – just the catch on the lid and we could still get it to close by kind of wedging it down under the rim. My solution to this was to carry on with it, but Mr Techno decided enough was enough and bought us a new bin. But not from the B&Q just down the road. Or any of the many small local shops who sell household items. Nope. He decided to order one online instead. It arrived on Wednesday (whilst I was in waiting on the shelves which are still nowhere to be found), in the biggest box I have ever seen. Getting it up the stairs was a real challenge. Once up in the flat, it took up half our living room. Clearly, this was too good an opportunity to ignore. The box was a wonderful prop for our lazy weekend. Tom spent most of Saturday morning playing in it. I cut a little entrance way, which makes me think a bit of a drawbridge, so he could get in and out by himself. Which just made it even funnier. 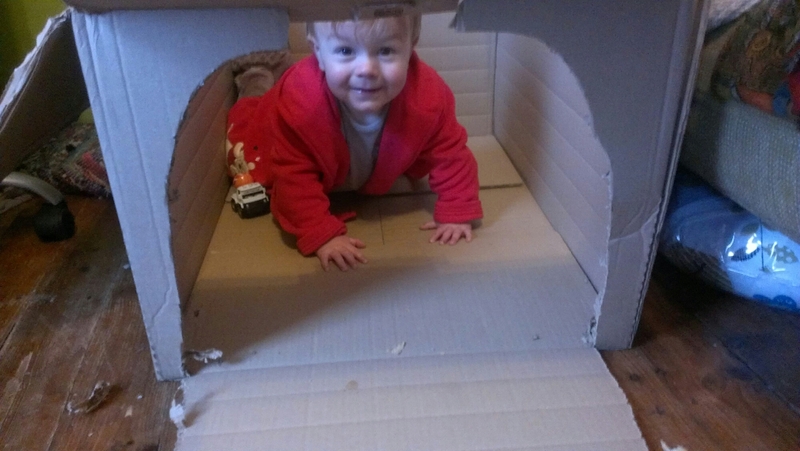 Since he was having so much fun, I decided the box could stay…just not in the living room. After a lot of maneuvering, I managed to get it in the corner of his room that used to be occupied by his blanket fort. Believe me, it was not easy getting it there, especially with Tom ‘helping’. And it does still block the bottom draw of his chest of draws (which only contains clothes that are currently too big, so isn’t really a problem). But I thought it looked pretty good, especially once I had moved his fleece in there. Cosy. Of course, Tom hasn’t glanced at it once since I moved it. Still, it was good fun whilst it lasted. We’ve been having an ongoing issue with Tom and stairs. He started off so well. 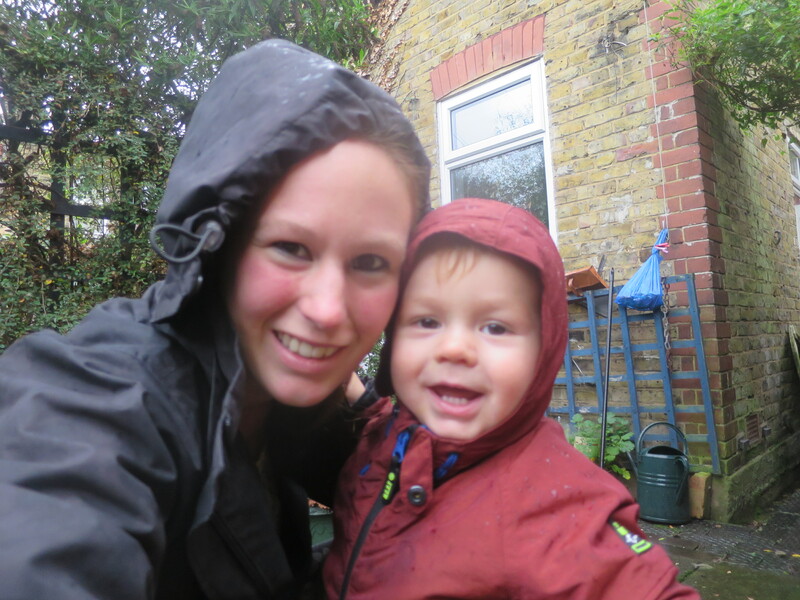 At around 10 months, when he had been crawling for a couple of months, he crawled over to the stairs up to our flat after we got back from nursery one day and climbed all the way to the top, with me following anxiously behind. A month or so later, we were staying at my in-laws where there are loads of rooms with a step or two down into them. We spent the weekend teaching Tom to turn round and go down the steps backwards. By the end of the weekend he had it down, and was able to repeat the trick to go down the whole staircase in our flat (though we kept the stair-gate closed to stop any unsupervised stair explorations). Even once he could walk he was really good about stopping, getting down and going down backwards. Then…he had a few rough weeks with colds and teething. And we are always in such a hurry when we go to nursery in the mornings. Tom started crying when I tried to get him to go down (or up) the stairs by himself and I kept giving in and carrying him. It got to the point that he didn’t even try to attempt them himself and would just step into my arms (with me a couple of steps lower than him) and be carried down. A wake up call came before Christmas, when we were staying with a friend. She has a couple of steps down from her kitchen into her dining area, all of which is tiled. Tom had been great all weekend about not going near the steps. But I was on my own with him early on Sunday morning and he had broken a Christmas decoration down in the dining area. So I moved him into the main kitchen to stop him hurting himself on the broken pieces, grabbed a dustpan, and went down to clean it up. I was nowhere near the steps. Since Tom hadn’t come near the edge for the past two days unless an adult was there to carry him down, I assumed he would stay at the top. He just stepped straight off. No hesitation. I had never seen him be so careless – he is usually really aware of drops and edges and handles them really sensibly (he was quite upset about not being allowed to play with the Christmas decorations anymore, which I guess caused the lapse in judgement). Luckily he wasn’t badly hurt, though the shock was enough to have him in tears. But Mr Techno and I were properly shaken. We agreed then and there that we would get stricter about Tom going down stairs by himself, or would pick him up well before we got to the stairs if we were in a hurry, not at the top step. We’ve been pretty good about sticking to it since then. But Tom has still been very reluctant to make his own way down. He’s fine if we help him turn round and get down onto the first step, but has been struggling to make that first move. Last week, we were on our way out to play. I had gone down a couple of steps and was trying to persuade Tom to ‘get down and go down backwards’. He was dithering at the top – he’d come to the edge, lift his arms out to me, back off, get down on all fours, get half way round, stop, get back up again, then come back to the edge. Usually, I would have picked him up, turned him round, and helped him down that first step. But this time I decided to wait and see what he would do. I was ready to catch him if he miscalculated, and we had plenty of time for him to work it out. He didn’t do what I thought he would. No getting down on all fours first and then reversing down. Instead, he reached out, grabbed the rail, and stepped onto the first step. It took him a couple of tries to get the distance right and my heart was in my mouth the whole time. It took everything I have not to interfere. But I managed it. And so did he. On the third attempt he managed to use the rail to steady himself enough to lower his foot onto the first step. Then he half-turned to bring the other one down, smiled at me…and turned the rest of the way round to continue backwards down the stairs. Yet more proof that I should have more trust in my child. He may not do things the way I want him too. But he can do them. I just need to get out of his way and let him figure it out for himself. And be ready to catch him if he gets it wrong. Now, before you read the title of this post and jump to the wrong conclusion, I should say that Tom does own toys. Lots of toys, in fact. He has train sets and toy cars and stuffed toys and musical instruments and various things that stack and a whole bunch of other stuff. And he does play with them. Sometimes. But the more I watch him potter round the house, the more I realise we could have saved our money and only bought him a couple of toy cars. If that. Wednesday was a frustrating day. I have it off work, the morning was fairly sunny, and I was dying to get out onto the Marshes. 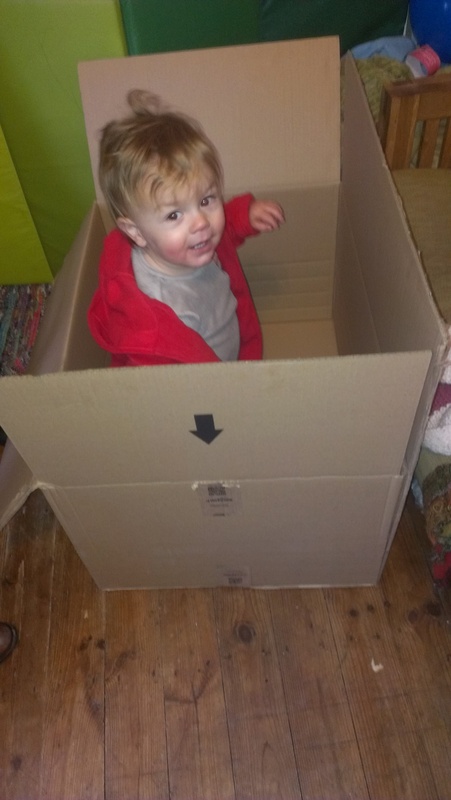 But we were due to get two big deliveries – a crate of wine (hurray!) – and a new set of shelves for Tom’s room…to store all those toys he doesn’t play with. So we were stuck in. We couldn’t even get out to the back garden, because I can’t hear the doorbell from out there. Despite my occasional bouncing round the house going ‘I want to go out‘ (very mature, I know. It’s supposed to be the toddler behaving that way), we did manage to entertain ourselves pretty well. We read lots of stories in the morning, sang nursery rhymes and chased each other around the flat, then Tom went down for his nap. When he got up, he helped me pod beans for our lunch. Lunch eaten, I realised that we could actually go out…into the front garden. Well, I say garden. It’s more of a bin storage area. And technically only the access to our front door is ours, the rest belongs to our downstairs neighbour. But hey, we can definitely hear any delivery drivers from there and I was not staying in a moment longer. We played hide and seek around the bins, chased each other round in circles, and experimented with Tom’s new found ability to open and close doors (trickier since he can’t actually reach the handle on the front door, so I kept having to open it for him).No toys required, but a surprising amount of energy expended considering the tiny space. After about an hour, we had exhausted the possibilities of the front garden, so we went back in and Tom happily rearranged the shoes on our shoe rack. Since I wasn’t such a fan of the shoe game, we went back upstairs and made biscuits. Which was both fun and very messy. Whilst they baked, I sat down with a coffee and Tom spent about 45 minutes pretending to pour water out of an empty bottle into a candle, then pretending to drink out of the candle (it wasn’t lit, obviously). I got fed some too. Once he was bored of that game, he emptied out the contents of my handbag and put them back again. Over and over and over again. Then he got two containers and our set of dominoes, and spent about an hour and a half transferring the dominoes from one container to the other. I’m not exaggerating. He was so focused that I ended up changing his nappy in the living room, with him still playing, because I didn’t want to break his concentration. Later, he kicked a balloon around for a while, then had dinner. He spent the evening climbing on and off the sofa (he’s only just gotten tall enough to manage it), making piles of blankets on the floor and jumping on them, and emptying out a pack of cards all over the floor, then rearranging them into different piles. At which point I suddenly realised it was bath time (which had nothing to do with a desire to prevent any more mess being made..at all…honest). Almost a whole day indoors and the only purpose-bought toy he played with was his peg puzzle…and that was only because I was making him stay still so I could put his pjs on. Which begs the question…why did we buy him any toys in the first place when he clearly doesn’t need them?